Comfort comes when my belly is full. I imagine it must be linked to my preverbal experiences in childhood. Perhaps, something to do with baby + food = happy & loved (x’s 5 million). This mixed emotional, physical cocktail makes my Pavlovian habit to comfort with food tricky and difficult to discern from actual hunger and my body’s need for food as fuel. It confuses portion size and makes choosing healthy options seem unnecessary. 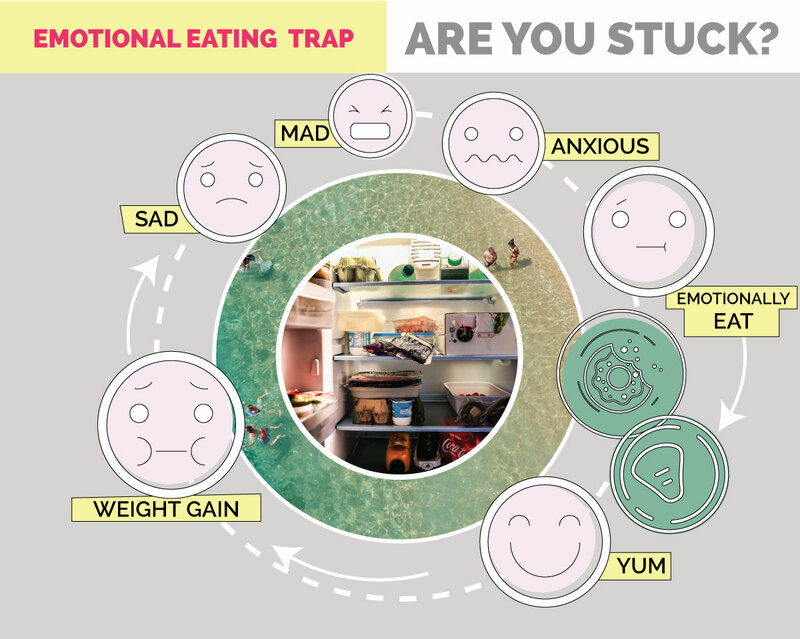 When I don’t deal with my emotions properly they can start directing me right to the pantry. I become a puppet to my emotions, feeding myself the wrong type of comfort. Food is never the answer to comfort loneliness, sadness, heartbreak, anger, or stress. Food is to satisfy hunger alone, not emotional needs. If I don’t deal with the emotions underlying my need for comfort, I will go back to food again-and-again. But, the comfort food gives is only temporary. It ultimately becomes an unhelpful distraction, compounds the problem, and makes me feel even worse with unwanted weight gain. For me, the secrets of weight loss have been tucked away in the practice of mindfulness. I quiet myself down and ask myself without judgement throughout the day: “How do I feel right now?”. I’ve trained myself to be more self-aware, gentle, and active in meeting my different needs. My body tells me things like: I’m thirsty, I’m hungry, I’m tired, I’m restless, I’m tight. I can then honor what I’ve learned and serve my body with tenderness and duty by taking care of those needs. My heart may inform me: I’m sad, I’m hurt, I’m happy, I’m excited. If there is a need there, I can take the time to care for myself in ways other than food. I can feel the feelings and let them have their work in me. I can call a friend and share. I can pray or read God’s comforting words. My spirit may tell me: I’m needy for God’s love, I’m full of joy. I can answer the heart-beat of my spirit too and take care of myself in that way. Emotionally, the good and bad (whatever feelings we discover), it’s all important. There is a digging process to unearth what’s there; to be more self-aware. This takes hard work, yet, this kind of work doesn’t take gloves, shovels, and hard hats. For we are women. You can’t use a shovel against the fine paper pages of our hearts. It’s delicate work but hard work none-the-less. Moment by moment we can check in with ourselves and serve our own hearts, minds, and bodies with tenderness and care. I can take care of myself with the simplest of adjustments. I can build trust with myself, that I will honor what my mind, body, and spirit tell me. When I take the time to be mindful I learn these small revelations that lead to better choices and ultimately these culminate into a better life long-term. Don’t be impatient. These simple changes add up. So, don’t give up too soon if you haven’t lost the weight you were hoping. Your body is waiting to see if you are faithful and caring before it will lose weight. It’s waiting to see if this change is for real. It won’t be bullied or mistreated either. (Not for long, at least.) So no more cruel workouts. Gentle, timely, yet challenging and especially enjoyable workouts are what’s needed. The body is waiting to see if you will take its needs seriously and lovingly serve it over the long-haul. Once you prove faithful, it will be happy to change with you. • Is this an attempt to meet an emotional need for comfort? Food is not the answer to comfort loneliness, sadness, heartbreak, hopelessness, depression, anger, or stress. Food is to satisfy hunger alone. I must be a true analyzer of what is actually going on inside of me. No one else can do that for me. I reframe food as nourishment for my physical body and never as emotional comfort. • I assess myself. Do I need to go to the bathroom? Am I tired? These needs will compete with hunger. Hunger is the most pleasant need to satisfy as our taste buds and minds are rewarded infinitely. So I put this last in the hierarchy of need-meeting. Once I take care of all of my other needs, I will have a much clearer mind to discern how I can meet my hunger-need and I am more likely to make better choices on portion control and nutrition. • Once I start eating it can be hard to stop. All of the good feelings and tastes start taking over and portion control can go right out the window. That’s why I use my fist as a guide for portion control. See article on The Perfect Portion for more information. Emotionally, it takes bravery to shine a light into the darkness of who we are. It takes time to discover what’s deep inside especially if it’s been buried for a long while. It will get easier and fun. If you are scared to find out what emotions are hiding in there, uncovered hurts, etc., I understand. Remember, God is with you every step of the way. There is no emotion He can’t handle and you are not alone, because He is constantly by your side even when you can’t feel Him. Slowly we will dig ourselves out into the light and realize we are beautiful. If you are a woman, God has made you to be overwhelmingly lovely, inside and out. It’s time we claimed that in every area of our lives.